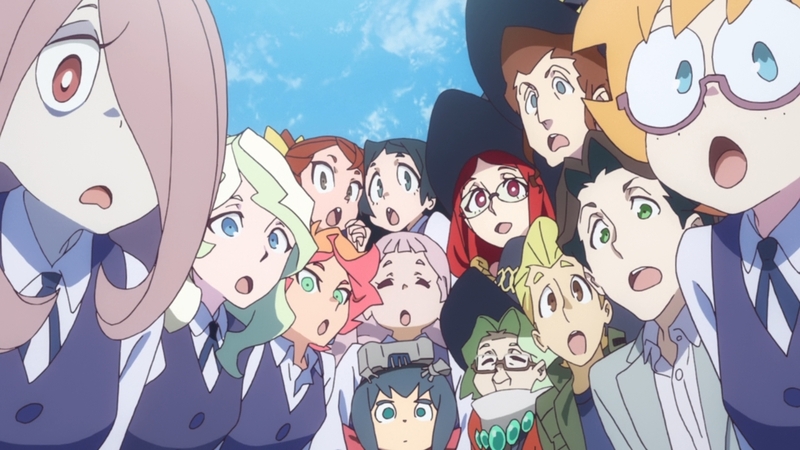 Little Witch Academia was an enjoyable surprise when the OVA was released back in 2013. The partially kickstarter funded sequel in 2015 was also really enjoyable. So it isn’t a surprise that Trigger decided to turn it into a full blown TV series. And honestly going into this series I had relatively high expectations that Trigger could do something great with the concept. By the end of the show I don’t think it really lived up to my initial expectations, but it is still a fun and optimistic show. They weren’t really aiming to turn this into Harry Potter the anime. There are some serious moments and emotional scenes in the show. But it isn’t about heroic sacrifice, but personal growth. 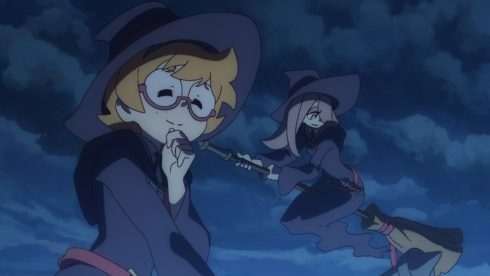 LWA is a show that really does keep focus very tight on the main character. To the degree that the appearance rate of the various side characters depend pretty heavily on how important they are to Akko’s story. Sometimes can have the feeling of “waiting for the plot to begin” but with this show the plot really is the main character’s growth and character arc. In a sense the story is only important to the degree that it relates to her personal growth. But things that don’t make sense early on make sense by the end. And there’s no doubt that Akko has real personal growth by the end. I think how much a person will enjoy this show will relate to how they feel about Akko as a character. If you don’t care to see how she grows through the show it might be a tougher watch. 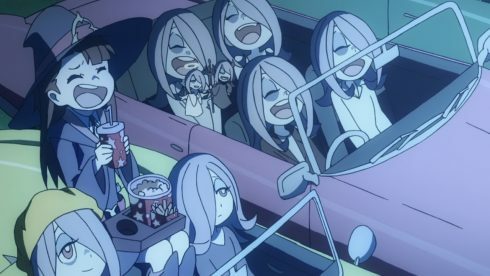 The setting in LWA is fairly similar to the normal world that we live in. People have smartphones, drive in cars, live in various countries, etc. The only difference is that magic really exists there. There are witch families with long lasting lineages and magical schools set up in order for them to learn their craft. Atsuko Kagari (our MC) is not from one of those families. She is a normal girl who fell in love with magic as a child and wants to become a witch. This happened because she saw a magical show put up by “Shiny Chariot” as a child and was utterly entrenched. She decided when she was old enough to go a witch school called Luna Nova because Chariot herself graduated from there. Her adventures really begin once she heads to the school and starts attending classes. Another unusual aspect of this setting is that people are basically not interested in magic. They are happy with the technological innovations they’ve accomplished. 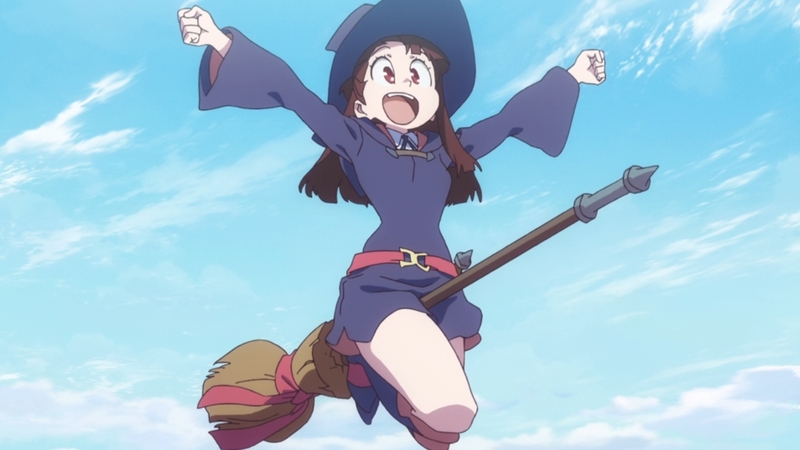 This makes Akko an unique character in terms of wanting to learn magic and also for being accepted into a witch school. If magic was at the peak of popularity it’s unlikely a history rich school like Luna Nova would be opening its doors to a normal girl like Akko. The lack of belief does tap into the theme of the story and pays off by the end. 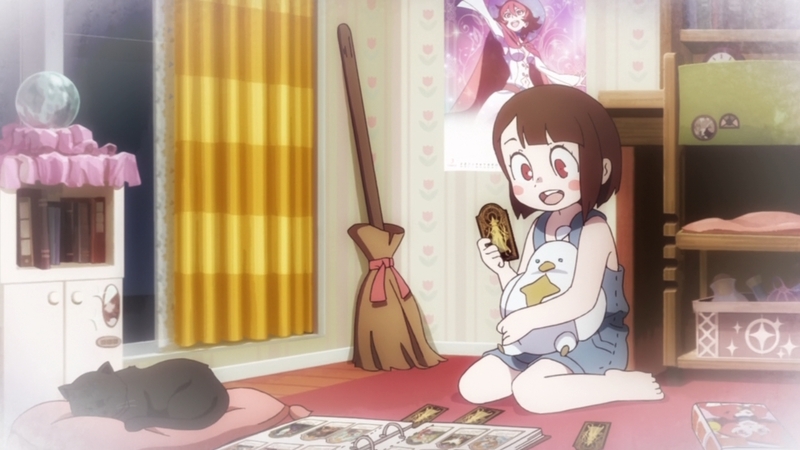 The story does tend to follow Akko around as she interacts with the various side characters. It really is her journey. 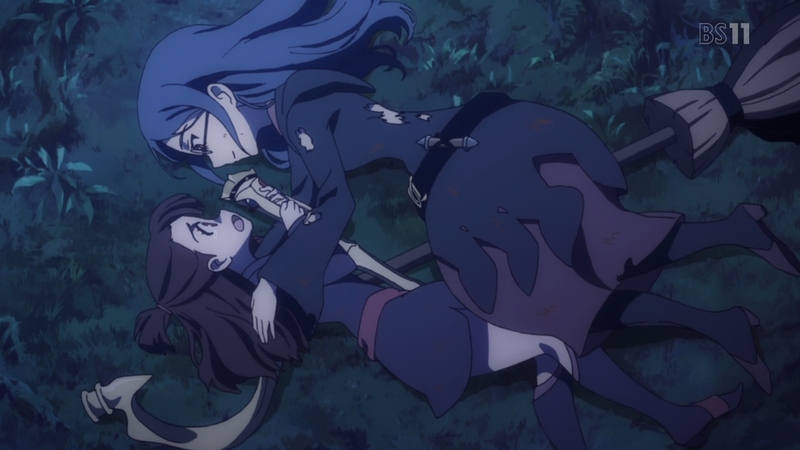 Akko gets a fair number of big emotional character moments sprinkled through the story. And one nice thing is that the lessons she learns do have an impact on her going forward. At times the story can feel like a series of random episodes. But along the way the story does lock into an overall arc. And even things you can predict early are just part of the bigger picture. Of course the main star of the show is Atsuko Kagari. Akko is a bundle of energy who borders slightly at being out of control early on in the show. Her passion for the magic she fell in love with as a child can get her into trouble. 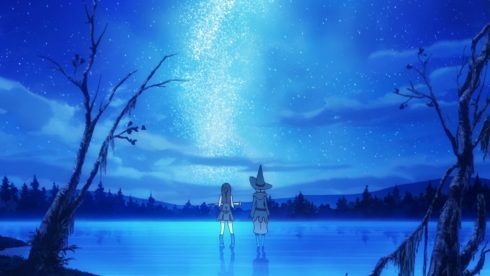 Early on Akko finds herself in a great deal of trouble for clashing with classic rules expected for witches. She does experience a great deal of character growth throughout the series. Akko matures through the show and yet still retains her core energy. It is just interesting to see the lessons that Akko learns along the way and how she incorporates that into her character. Akko is the type of person who pulls along other people in her wake and sets the pace. She isn’t the most talented or the most gifted. But what Akko can do is struggle against her weakness. There are obviously more characters than just Akko. I do think it is tougher to argue who the second most important character is. Looking at the series as a whole I’d probably give that spot to Professor Ursula. This teacher basically serves as Akko’s mentor throughout the show and guides her along her personal journey. Not a very experienced teacher, but one that doesn’t allow Akko’s quirky personality to shake her up. She has a reasonably important secret that explains a lot of her actions. But if nothing else she gives Akko a motivated ally in a school that she’s not fully prepared to attend. 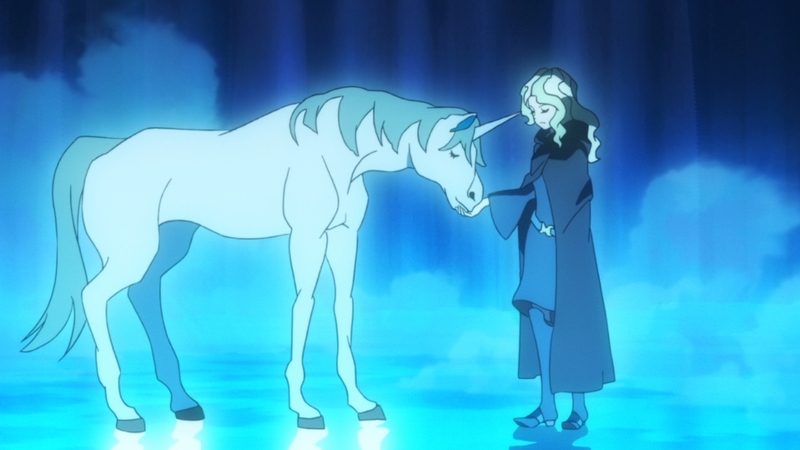 And honestly Ursula has some of the more badass moments in the show. This is someone who really has to work hard with Akko. Ursula is also someone who has to face personal challenges and rise above them. While she doesn’t get that much screen time, Diana Cavendish is certainly one of the more important characters for the story. 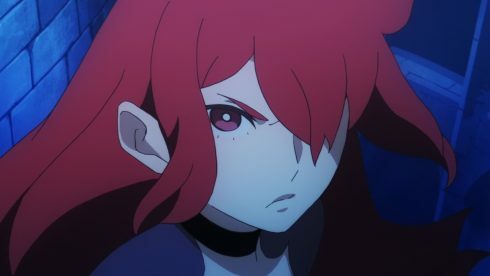 Honestly one negative I’d give for the story is making her such an important contrast/rival for Akko and yet not focusing enough on her. She eventually does get character moments in the story. 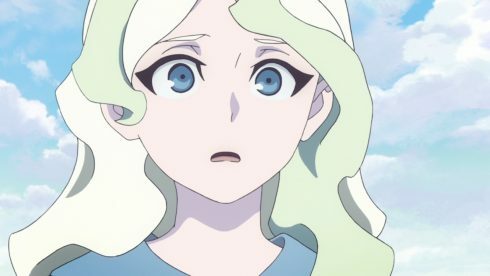 It isn’t as if the show completely ignores Diana, but it’s a limited role. She is the elite character. Diana is basically more capable than her own teachers are. And she certainly has a lot of pride. At her core Diana is a good person with altruistic goals. By the end of the show I really did like her character. 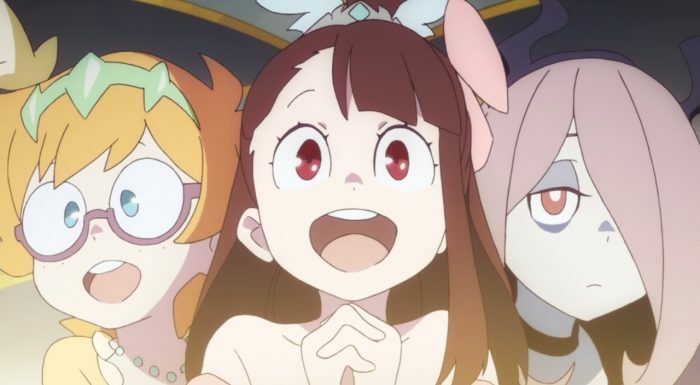 I’m simply wishing that the story pulled away from Akko just a bit more to share the spotlight. In terms of characters that could have used more spotlight are Sucy Manbavaran and Lotte Yansson. These two are Akko’s best friends in the story and have a reasonably prominent role in the first half of the show. But honestly as the show moves ahead they become increasingly less prominent. I find that to be a bit of a shame since they are pretty interesting. Sucy is just an utterly weird person. Her obsession with poisons and mushrooms makes her someone you’d like to see more of. 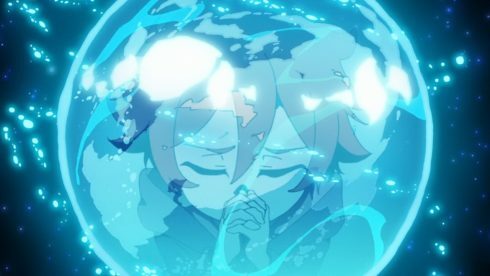 On the other hand Lotte is a very pure and good person. She can appear a bit plain, but really shine when it comes to her own passions. They do have some good moments sprinkled through the show, but looking back I would have liked to see more of them. That is the strength and weakness for LWA. 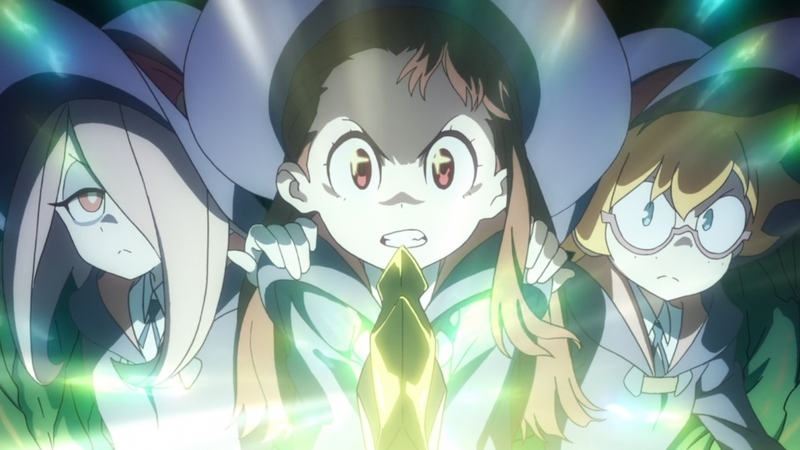 The story focuses on Akko’s personal journey. The characters that she interacts with on that journey get focus while they are in her presence, but are kind of forgotten about when they aren’t. I suppose that is both a positive and a negative at the same time. It is a pretty bright and colourful series. The visuals certainly fit the overall tone of the series. It has the usual Trigger animation style. Not to the extreme of something like Kill la Kill’s Mako, but occasionally it gets over the top. They have a very nice way of animating magic and making it look magical. A lot of twinkling star effects make sure you can appreciate that they are doing is pretty special. They do a good job animating things like transformation, flying, and even some occasional action sequences. And there are a few big action sequences in the show that deserve the attention they give to them. The characters look good and unique. There are a lot of random students and characters, and they all have their own style. It doesn’t look like a bunch of clones everywhere. Trigger has taken their time in doing it right. I will say the voice work is nice for this series. There wasn’t a random voice I couldn’t stand or someone who just didn’t seem to fit. Have to give special credit to Michiyo Murase for her work with Sucy. She really brought that character to life and made her fun to watch. 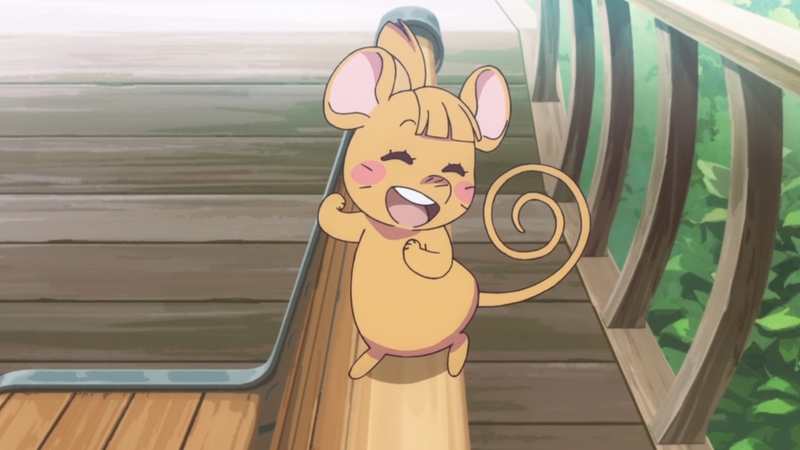 But will also say that Megumi Han did a nice job with Akko. She had to run the range from optimistic to desperately emotional. The music for the show itself was pretty solid. It really brought to life some of the more mystical/magical moments for Akko’s journey. And of course the OP/ED songs we got this season were all quite nice. In the end LWA was a good show. The story structure probably did lose some people along the way. Which is a shame since it pays off. At times in the early going it does feel like some random adventures. But, I will say that the early part of the show does some heavy lifting for world building and setting Akko’s character arc. Personally I enjoyed the early going with the show. It was just entertaining fun. And the later parts of the show did some strong emotional episodes. They really did a solid job making full use of what drama this series did have and Akko’s character arc. Overall it is a pretty positive series. The big message Akko took away from Chariot’s show was “a believing heart is your magic” and the show really does run with that. That it is important to chase your dreams. Even if you fail a lot, it is important to keep trying. I don’t think it is an amazing series, but it is a good one. And I do think it is worth giving a watch. It’s unapologetically positive. I think it earns that simply good feeling I had by the end of the show.